Nobody likes to spend their hard earned cash on driver bits or sockets, only to have them break after a few uses in your impact driver. This used to be a big problem when impact drivers were first introduced and people might be noticing it again now that impacts are offering even more torque. 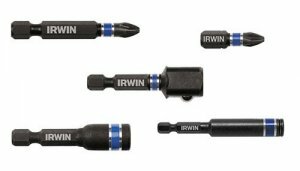 Irwin has introduced a new Impact Performance Line that has been designed with today's impact drivers in mind. One thing they talk about is how other brands accessories are compatible with impacts, but Irwin's Impact Performance Series of accessories have been specifically engineered to deliver maximum durability and long life in impacts. Irwin's current Impact Performance line includes driver bit for Phillips, Square, Torx, and tamper resistant Torx. Irwin's bit are forged rather than milled and Irwin says this gives the bits a more precise fit and improves bit life. Also offered in the line are bit holders, nutsetters, and socket adapters. All feature a black oxide finish that reduces corrosion, which also increases the life of the bit. The suggested retail price for driving bits ranges from $0.99 to $5.99, nutsetters from $3.49 to $9.99, socket adapters from $3.49 to $5.99, and bit holders from $3.99 to $6.99. Multiple set configurations are also available, with prices ranging from $9.99 to $39.99.